When you get the opportunity to enjoy the Great Lakes region, consider one of these 5 best Lake Superior backpacking hikes. The paths around the lake are traveler-friendly, and beautiful sights await you and your hiking companions. Lake Superior, the largest of the five Great Lakes, is surrounded by Ontario, Minnesota, Wisconsin, and Michigan. More than 200 bodies of water feed into this lake, and it is known as the world's largest freshwater lake. Lake Superior's basin was created by volcanic eruptions. The shoreline is a wonderful mixture of beaches, rugged rock, and cliffs, and the lake itself is filled with trout, salmon, and brown trout. Since Lake Superior borders three states in the USA and one province in Canada, there are various trails in all of the regions, many of them in national parks with rivers and waterfalls. The hiking season is from May after the snow melts until late October, before the winter snows arrive. If you want to hike the entire lake's shoreline, consider a Circle Tour. Many start in Duluth, Minnesota, and then travel up the North Shore east toward Ontario and then head back south again just before reaching the border. The complete hike can take an average of three to four weeks. If, due to time and energy, you are unable to complete the entire Circle Tour, there are shorter hikes within the whole circle, between Duluth and Ontario. In the USA, the trail from Duluth up the North Shore is called The Superior Hiking Trail. The trail is accessible from State Highway 61, secondary roads, and trails which feed into the larger trail. All trails are well-marked and maps are available at all information centers, state parks and campgrounds, and many of the local resorts. You may want to join the Superior Hiking Trail Association. Their website has a detailed map of the towns and landmarks that are along this 210-mile trail. With dozens of beautiful hiking trails along Lake Superior, it is hard to narrow the choices down to only a handful. Below are 5 best Lake Superior backpacking hikes that have been enjoyed along Minnesota's North Shore over the years. These are more difficult treks, ideal for the backpacking hiker. Since the lake is also shared by Wisconsin, Michigan, and Ontario, accessible trails in each of these regions are described later under Other Backpacking Hikes.Maps for all hikes can be downloaded at North Shores State Parks. This is a six-mile moderate hike. Temperance River State Park is off of Highway 61 in Schroeder, Minnesota. When you enter the park, you will find parking and trail access. There are trails on both sides of the Temperance River; chose which one suits you. Along the rocky ledges of the shore, you will see seven overlooks. Hidden Falls is located on the western side of the park. The trails can take up to 26 miles to complete. Loon Lake Landing off of the Gunflint Trail (County Road 12) is where you will find parking and access to this trail. You can also enter from any of the resorts or at the Gunflint Lake Lodge. This trail joins the Magnetic Rock Hiking Trail from the trails near Moosehorn Lodge. From the southern side of Gunflint Lake, the views are beautiful. Access and parking to the trails are in the Cascade River State Park along Hwy 61 next to the Cascade River Bridge. Hiking trails are along both sides of the Cascade River, offering views of waterfalls. 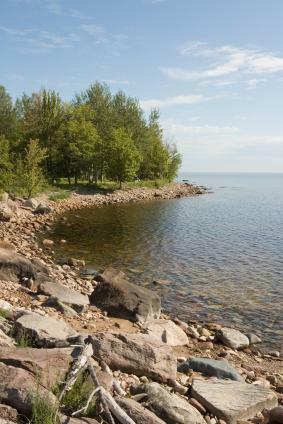 Some trails intersect and will take you along the rocky shores of Lake Superior. A trail to Lookout Mountain also intersects. The Cascade River trails provide a moderate hike, covering 18 miles. This is a moderate seven-mile trail. Parking is available at the trail head off of the Gunflint Trail (County Road 12) across from Rockwood Lodge. Red and white pines are seen on this trail as the path spans from Polar Lake to South Lake, which borders Canada. The Grand Portage National Monument is about 36 miles east of Grand Marais off of Hwy 61. Parking is permitted here, and you will see signs for the Grand Portage Hiking Trail. This is a historic trail, once used by trappers, explorers, and the Ojibwe Indians. It winds above Lake Superior until it reaches Fort Charlotte on the banks of the Pigeon River. At 16.5 miles, this is a moderate to difficult hike. Campsites along the hiking trail are from six to eight miles apart in the seven state parks along the trail. Each site has a fire ring, room to pitch a tent, and a latrine. The Lodge to Lodge Camping Program is available for those who don't want to camp in a tent.In this program you can sleep in a different lodge each night. Some provide breakfast each morning, and sack lunches for you to eat as you hike. For those accessing the Lake from a location other than Minnesota, try these backpacking hikes. As you prepare for your hikes, why not read some helpful books by those who are seasoned travelers of the Lake Superior Trails?